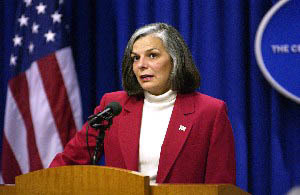 December 9, 2003 Atlanta, Georgia – Today, Julie Gerberding, M.D., Director of the Centers for Disease Control (CDC) in Atlanta, Georgia, held a telephone and auditorium press conference about the growing epidemic of the Influenza A H3N2 known as “Fujian,” the huge public demand for flu vaccine and the problem of limited supplies. Julie Gerberding, M.D., CDC Director, Atlanta, Georgia, conducting press conference with questions from reporters by phone and in press room. Photo courtesy CDC. Julie Gerberding, M.D., Director, Centers for Disease Control, Atlanta, Georgia: “We have a flu season that is getting off to a rapid start. It has not reached what we call the ‘epidemic threshold’ yet in terms of deaths. But we wouldn’t be surprised to see that happen, given the pattern that is emerging right now. The good news is that we’ve probably vaccinated more people than we ever have before against influenza and that means more people than ever are protected. But the unfortunate situation is that there are still local shortages and we have to take steps to address those shortages. THERE ARE A LOT OF REPORTS OF CHILDREN BEING ILL AND SOME OF THEM DYING. ARE THEY HAVING A PARTICULARLY DIFFICULT TIME WITH THE FUJIAN STRAIN? Yes, there are reports of children with serious influenza and deaths. That is very sad and something we are evaluating carefully to see if there is anything about this particular flu strain that is preferentially affecting children or causing more disease in children. We don’t know the answer to that question yet. It is common for children to develop severe influenza and for deaths to occur in every flu season, unfortunately. So, it will take some time to figure this season out. When severe flu occurs, usually it causes a pneumonia in those people who have to be hospitalized. But a common cause of more severe illness and death is a bacterial infection that can complicate the viral influenza illness. Some of the children who have died have had complicating bacterial infections. We know that some areas of the country are especially hit hard (Colorado, Texas, Arkansas) with influenza and it’s been a very difficult and frightening thing for many people, particularly in the context of reports of vaccine shortages. Influenza typically kills more than 36,000 Americans each year and some of those are children and some are seniors and can affect people of all ages. What we know right now is that flu is widespread in 13 states and at the end of last week there were only 2 states that had not reported any influenza: that was Washington, D. C. and Massachusetts. But we expect flu to reach those areas. The heaviest hit states so far have been in the West and we’re waiting to see what happens in the East. The bottom line is that we have not peaked the flu season this year. We expect more cases and will keep watching the outbreaks. The main concern we are faced with at CDC is the gap between demand for vaccine and the supply of vaccine. – about 4 million doses of Flu-Mist, which is for healthy people between the ages of 5 and 49. – 73 million doses of inactivated (killed viruses) tri-valent vaccine for adult immunization. That vaccine has largely been distributed and manufacturers are pretty much out of the killed virus vaccine. There are however almost 4 million of the Flu-Mist that is breathed in the nose for healthy people. You said you are looking for more vaccine products overseas. What products are those and how much do you think you can get? Secretary Tommy Thompson has asked us to look into purchasing what might be available from a European manufacture of flu vaccine in the U. K. (Chiron Corp.) They do have less than half a million doses that might be available that is licensed for use in the U. S., but is not cleared because it has not gone through all the stages of approval. We’re working with the FDA and the company to see if it would be safe to get that vaccine supplies into the United States to have any impact on this year’s flu season. Is the flu vaccine you are considering purchasing from Europe the same we have here? The European vaccine that we are looking at has the same protection as the vaccine we are using here. So, it’s a different manufacturer, but created using the same principals and decisions that were used to create the one we’re using here. Flu-Mist is made from live flu virus and I understand that is not safe for health care professionals to get? Also, is Flu-Mist safe for children over age 5 because it is a live virus? What are the pros and cons of Flu-Mist? The question about Flu-Mist is a good one. Flu mist is a live attenuated virus, unlike the vaccine shot which is a killed influenza virus. Flu-Mist is attenuated in more than one way, but one of the ways is that it does not grow very well at certain temperatures and so it’s very unlikely to cause flu disease. But because there is concern that in an immuno-suppressed individual perhaps there could be greater potential for even an attenuated virus to cause severe disease of influenza-like illness, it’s not been recommended for people in those groups. In addition, health care workers who take care of people in those groups should not have contact with the patients after they have the nasal spray. There are unusual symptoms associated with this flu, stomach cramps in adults and some mental status changes in children. Is this unusual appearing this year? And could you comment on the multi-drug-resistant staph infection is complicating flu this year in a way we haven’t seen before? The range of symptoms in flu can include stomach and intestinal cramping and nausea. So the abdominal symptoms aren’t outside what might be seen in a typical flu season. In children who are severely ill and have high fever, there are many things that can be related. I don’t know the specifics of the cases you are reporting, but if there is anything unusual, I’m sure the investigators will look into that. See Part 2: Unprecedented Number of Influenza A Complications and Deaths in Children. Previous PostPrevious “Smoking Gun” Evidence That Liquid Water Has Flowed on Mars? Next PostNext China to the Moon?